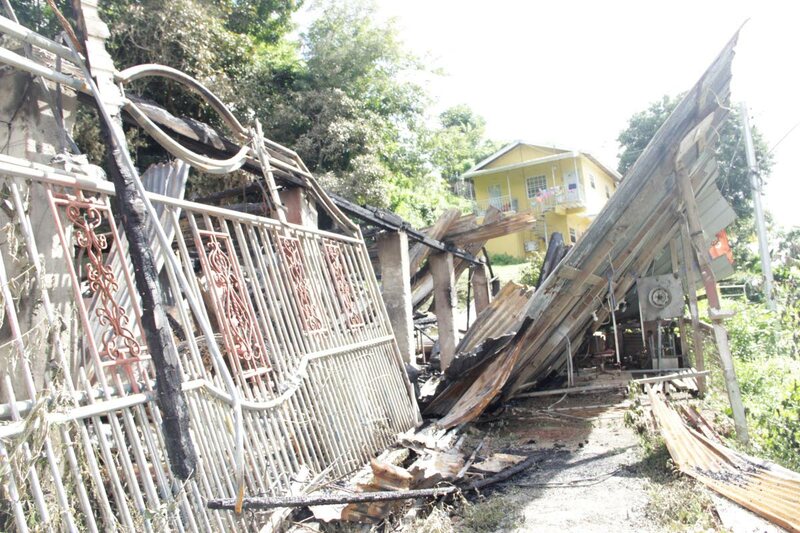 Remains of a house which was destroyed by fire on Monday at Eboe Gully, Crown Trace, Les Coteaux. Quick action by neighbours saved the lives of three children, all under the ages of eight, who were at home alone when fire gutted their Eboe Gully, Crown Trace, Les Coteaux home on Monday. Neighbour Sislyn Trim Augustine told Newsday that she was at her home next door to the gutted house, sitting in her living room doing a puzzle when she felt the heat, but didn’t think anything of it because of the hot weather. “Then I heard a noise… my neighbours who live opposite to me, were calling out to me saying that the house next door is on fire. calling the children and she bawling and calling them as well. “Eventually we got them to come out of the house, but they wanted to run back into the house because they wanted to get their school bags and books. They had just come from school. “The parents were not at home at the time of the fire and all three children were under the age of eight," she said. “We stood up down the road until people start coming. Two young men ran into my home and took off my breaker because the fire had spread to my roof. They also had to move my two gas tanks to avoid the situation escalating,” she said. “They had to take my hose and spray the roof and under the ceiling to avoid fire spreading all the way in the house. She added, “the fire damaged my water tank, spouting, windows, chair and carpet by my kitchen. Eventually the Fire Service came because everyone was calling them. “They (the family) lost everything, even my nephew Hesbon Charles, fabricating/welding shop downstairs burn up. Everything gone,” she said. Augustine said the gutted building belonged to her older brother who passed away and that another of her brothers was now responsible for the upstairs and downstairs board house. Reply to "Neighbours rescue three children from burning house"